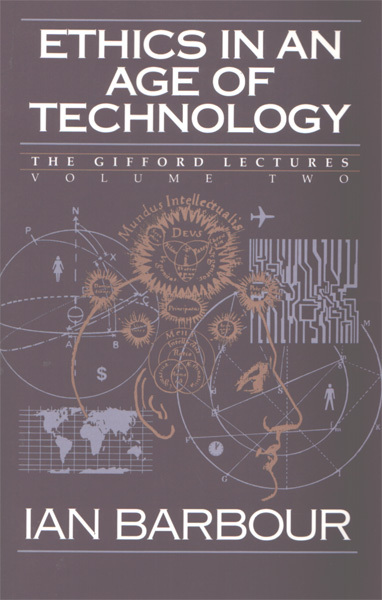 Ethics in an Age of Technology constitutes the second of a two-part series of Gifford Lectures that Ian Barbour presented at the University of Aberdeen. The first portion of the lectures, published as Religion in an Age of Science, probed the interaction of religion with the “methods and series of science.” This volume “deals with the challenges to ethics arising from technology and applied science” (xv). Barbour separates his presentation into three parts, and the first and most important examines the “conflicting values that are relevant to the appraisal of technology” (xvii). Barbour takes a contextualist approach to the use of technology, explaining that technology is “neither inherently good nor inherently evil” but rather an “ambiguous instrument of power whose consequences depend on its social contexts” (15). He contends that the use of technology might be redirected toward good ends, specifically “to the realization of human and environmental values” (24). Concerning human values, Barbour identifies those most applicable to the individual—food and health, meaningful work, and personal fulfillment—and those most relevant to social life—social justice, participatory freedom, and economic development. Concerning environmental values, he identifies resource sustainability, environmental protection, and respect for all forms of life as important. Science, religion, and philosophy all have a role to play in assessing the relationship of technology to these values. Science can provide empirical data on such things as the practical costs of choosing one technology over another. Philosophy can bring clarity to discussions about ethics, particularly in regard to such concepts as justice and freedom. Religion can provide a motivating force for one’s ethical behavior. Drawing insights from these three disciplines, Barbour intends to wed the theory of justice provided by John Rawls to a broadly utilitarian understanding of ethics in order to provide a moral framework by which one can assess the given usage of a technology so that one might facilitate its redirection toward good ends. He does so with the hope that his framework will provide direction for a society struggling with many “conflicting values” concerning the employment of technology. The book's second part analyzes the use of technology in three specific areas according to Barbour’s framework: agriculture, energy, and computers. In the field of agriculture, Barbour calls for an emphasis on efficiency that does not neglect environmental concerns. In the field of energy, he desires a combination of both renewable resources and conservation. In the field of computers, he states that social justice demands that the information–poor have access to modern computing technology. The third and final part considers the future of technology. Barbour here offers a number of prescriptive statements. The extraordinary power of modern technology to destroy the environment demands that international action should occur on such matters as nuclear weapons, genetically modified foods, and the emission of carbon dioxide. The highly technical nature of modern technology means that governments should ensure that citizens participate in the democratic control of technology’s usage. The reliance on contemporary technology necessitates that one considers alternative lifestyles that emphasize frugality.